When we travel to foreign countries, our family likes to do things on our own. We’ve never been super keen on taking group or private tours, choosing instead to find our own way and figure things out for ourselves. Bob, however, convinced Emily, Sarah and I on our trip to Bali that we could benefit from a guided bicycle tour. It would be fun, he suggested, and we might just learn something along the way. He was right, on both counts. 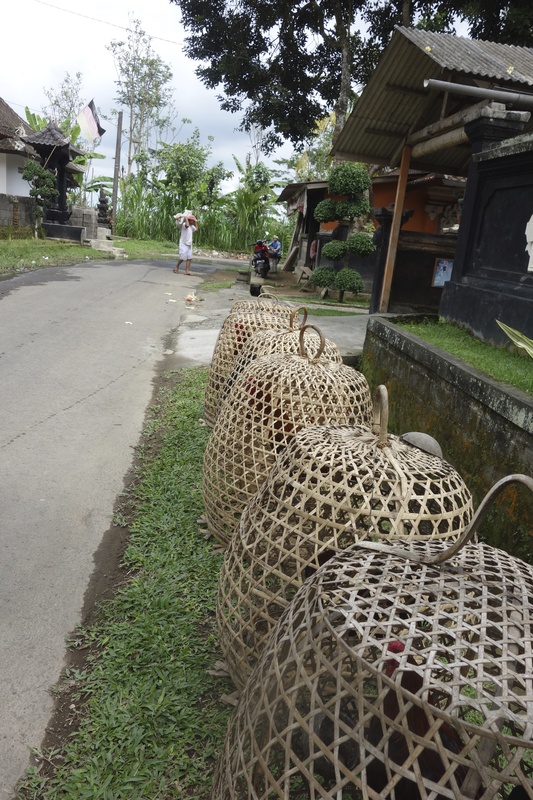 We booked a day-long bike tour with Sobek Adventures out of Ubud. The tour included breakfast, lunch, bike rentals, and transportation, and cost $79 each for Bob and I, and $52 each for Emily and Sarah. It was very well worth it. Sobek’s van picked us up at our Airbnb villa (read more about this fantastic abode located just outside Ubud here) at 8:30 on the morning of our tour. Our driver and our guide chatted with us along the way to our first stop, a coffee plantation specializing in coffee made from beans eaten by a Paradoxurus, (aka an Asian Palm Civet or Luwak) and then cleaned and roasted after the critter poops the beans out. Yes indeed, you read that correctly. We all were treated to a cup of what is commonly known as Luwak coffee. We drank it and it was good. I kid you not. 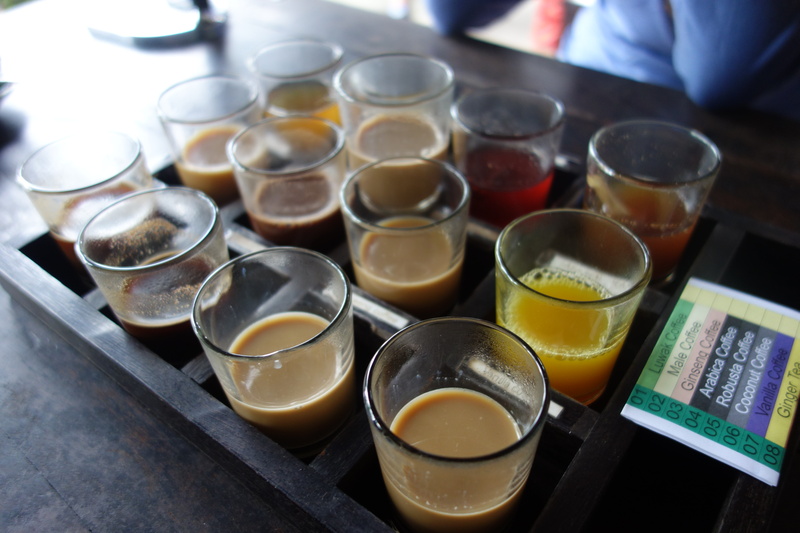 We were also treated to a tasting of a dozen or so other flavored coffees including coconut, vanilla and ginseng and they were all distinctive and delicious. After this not even slightly crappy stop (I couldn’t help myself) we headed to Mount Batur where we picked up our bicycles. Now my husband is a cyclist, and enjoys a high quality, well-tuned bicycle. These were not those. They did however have seats, brakes, and air in their tires, and since our ride was mostly downhill, that was really all we needed. The four of us rode with our guide Made, through villages, rice fields, and on some very rocky and bumpy dirt roads. Some of the routes we took went directly through rice fields, and locals with bundles of grasses and sticks on their backs eased out of our way and watched us roll by. Without a doubt, this was the best way to really see the 13 miles of back roads and trails that we covered that day. We took a break from our downhill coasting to look in the gates of a local temple, mostly deserted and stunningly beautiful. Another stop was at a family compound, where seven locals were currently living, including two grandparents, two parents and three children. The family members were all at home, and sat out on the steps while we learned how Balinese live their everyday lives. This was the only part of the tour where I was uncomfortable. Frankly, it felt intrusive to be in their home, and it was never clear to me if we should have tipped the family, or brought some kind of offering to them. Our final stop of the day was at a restaurant where we had a set menu. It was one of the better meals we ate in Bali, and included a delicious chicken soup with rice, chicken and vegetables. 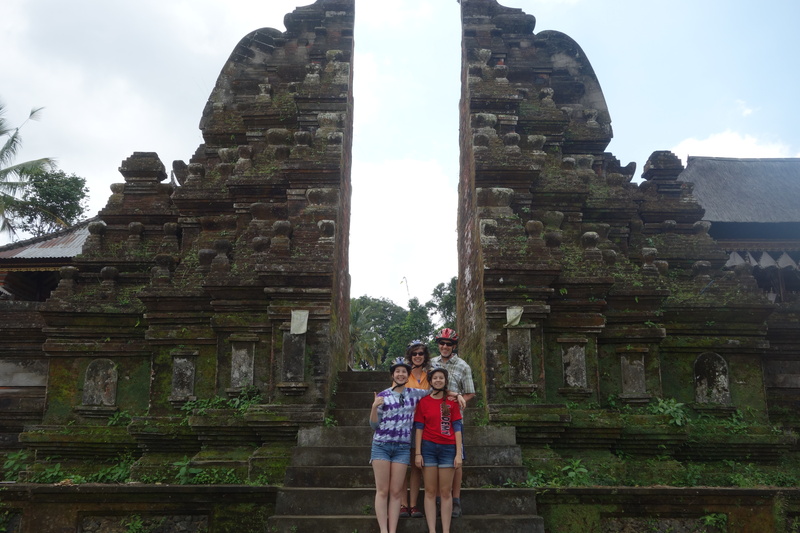 Our tour ended at 2:30 in the afternoon, right back where we started, at our great villa outside Ubud. I would highly recommend this tour to anyone, even a non-active person, as there is almost no work required. We ended our day with massages in central Ubud. And how fitting it was after spending two hours on a somewhat uncomfortable bike seat on bumpy roads to get a massage on my aching gluteus maximus. I have really enjoyed your articles. Thank you so much. Every issue of your ‘Travel Essentials’ newsletter has something to catch my attention, Nancy and Bob. Whether the item covered is a timely story, a travel vignette, a new product introduced or a humorous event described, there is always usable information provided In my estimation your newsletter is a reflection of you r Ashland business–complete in stock, approachable, fun to visit and above all else, trustworthy. Indeed, thank you for all your efforts! Warm Regards, Terryl P. Buntrock Fairfield, CA.